Spice up your Kitchen or Bathroom with these fun and rewarding projects! Are you looking for a quick and easy project that is very useful as well? 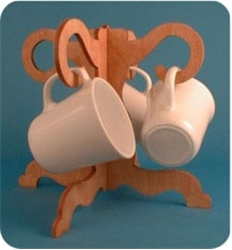 This handy mug rack fits the bill! 10”H. Our functional, unique kitchen helper is sure to bring smiles to any cook in the house. With a handy spice shelf and 3 divided sections it’s easy to keep your favorite cook organized 13” wide x 24” high. Here’s a quick and easy project that you can create in no time at all to hold your hand towels in the kitchen or bath. 16” high. any kitchen or dining room. Over 23” tall. you organize all of your favorite spices. 16” high. 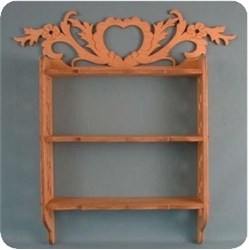 Display your favorite Spoon collection with our charming Spoon Rack project. 11 3/4” high. 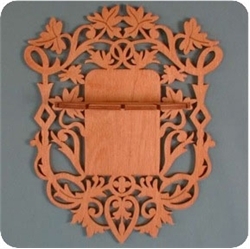 Delicate scrollwork serves up your favorite plate of hors d’oeuvres or sweets in elegant style. 10” diameter. 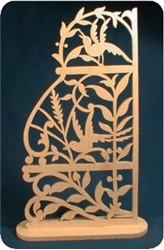 You’ll find many uses for this decorative screen from window decor to table top! 17” high. Our country holders will be beautiful and useful conversation pieces. Simple instructions for “popout” design included. 8” and over 10 inches long. Spruce up your bathroom decor with our decorative and functional cup holder. 9” tall. 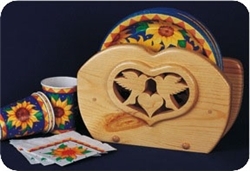 paper plate caddy will add a decorative touch to your kitchen as well as your outdoor BBQs. 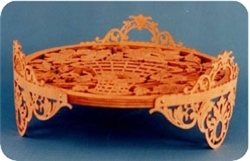 Designed to sit or hang, you’ll find this project to be very profitable at craft shows and bazaars. 11”W. 2 designs. 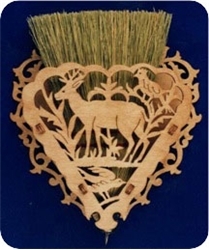 Always wonder what you could do to hang your whisk broom in a more stylish manner? Our Whisk Broom Holder project is your solution. 11” high.